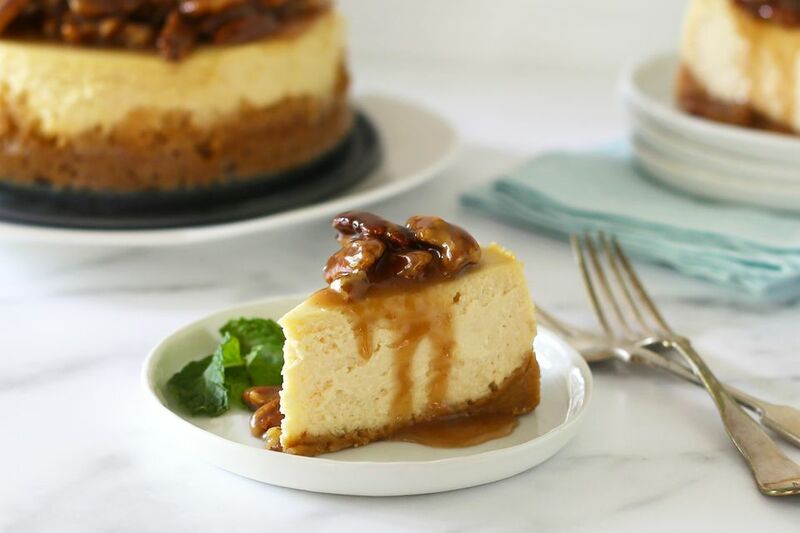 This Instant Pot cheesecake is a great example of the wide range of dishes that can be created in a pressure cooker. The cheesecake comes out of the Instant Pot perfectly cooked with a smooth top that's entirely free of cracks. The pecan pie topping makes the cheesecake an excellent choice for a Thanksgiving feast or Christmas dinner, but you don't have to wait for a holiday to make this rich, delicious dessert. Surprise your family tonight—serve plain, with a fruit topping, or a dollop of whipped cream. Prepare the cheesecake at least 4 hours in advance, or the day before you plan to serve it. Note: while there are multiple steps to this recipe, the Instant Pot cheesecake is broken down into workable categories to help you better plan for preparation and cooking. Lightly grease a 7-inch springform pan or spray it with nonstick cooking spray. In a medium bowl, combine the graham cracker crumbs with 1/4 cup of melted butter and 2 tablespoons of brown sugar. Mix thoroughly and then pat the crumbs firmly into the bottom and partially up the sides of the prepared springform pan. Place the pan in the freezer for 25 minutes. Place a trivet in the Instant Pot and add 1 1/2 cups of water. In a mixing bowl with an electric mixer, beat the cream cheese until smooth and creamy. Add the remaining 8 tablespoons of brown sugar and the cornstarch; beat until well blended. Add the eggs, one at a time, beating to blend them into the batter after each addition. Beat in the heavy cream and 2 teaspoons of vanilla extract just until blended. Avoid over-beating. Remove the crust from the freezer. Wrap the bottom and sides of the springform pan in foil. Fold a 24-inch length of foil lengthwise into thirds to make a sling and place the pan in the center. Pour the cheesecake filling into the crust. Place a paper towel over the top of the pan (this will help absorb excess moisture) and then cover the pan with a sheet of foil, sealing it around the edge. Carefully lower the cheesecake onto the trivet; lock the lid in place and ensure the vent is set to "sealing." Choose the manual setting, high pressure, and set the time for 38 minutes. When the time is up, let the pressure release naturally for 10 minutes and then carefully move the knob to "venting" for a quick release. Carefully lift the cheesecake from the Instant Pot and set it on a rack. Remove the foil. If the center is not yet set, place the pan back in the pot, lock the lid, and cook it on high pressure for about 3 to 4 minutes longer. Let the cheesecake cool completely. Cover and refrigerate it for at least 4 hours or overnight. Gather the ingredients for the pecan pie topping. Melt the 4 tablespoons of butter in a heavy saucepan over medium-low heat. Add 1/2 cup of brown sugar to the butter and continue to cook, stirring constantly, for 1 minute, or until the mixture is bubbly and the sugar has dissolved. Add the heavy cream, corn syrup, salt, and the pecans. Stir to blend. Cook until the pecans are coated and the topping is hot, stirring constantly. Add the vanilla and let the topping cool slightly. If the topping becomes too stiff, warm it a slightly before serving. Place the cheesecake on a serving plate. Cover the whole cheesecake with the topping or spoon it over individual servings. Add mint leaves or berries to the plates, if desired, and enjoy!